Charming Hale 'O Bali (House of Bali) liegt auf einem Landgut in der Nähe einen Morgen ihre Schwester benachbarten Hause, Java Kai (Listing # 388724) thront. Die Wohnungen werden separat gebucht. Wählen Sie zwischen Hale 'O Bali (1-4 Personen), Java Kai (1-6 Personen), oder buchen Sie beide und die gesamte einem Acker, privaten Anwesen. Die beiden Häuser können 1-10 Personen. Diese direkt am Meer, ist verbindlich, indonesischen Hartholzhäuser direkt an der Hauptküstenlinie Autobahn in Kaneohe auf der windzugewandten Seite von Oahu. Wir können Ihre Hochzeit / Empfang, Feiertag, Familientreffen, Feiern, ein Ereignis oder Rückzug zu hosten. Charmante, gemütliche, Hale 'O Bali hat 1 Schlafraum, 1 Bad mit einer alternativen Schlafboden über dem Master-Schlafzimmer, für ältere Kinder, die Besteigung des Steigleiter, anstatt sich in der Höhle auf dem bequemen Queen Futon Couch / Bett genießen würden. Genießen Sie die 1100 sq. Ft. Porzellan Fliesendeck Genießen Sie einen spektakulären Blick auf Kaneohe Bay und die Koolau Berge. Die hohe offene Balkendecken sind mit Woven Bamboo (Bedeg) geschmückt. Ihre Füße kühl an den Keramikfliesen überall zu bleiben. Tradewinds und Deckenventilatoren in jedem Zimmer sorgt für ein kühl und komfortabel. Genießen Sie den beruhigenden Klängen der Wasserfall aus dem Fisch und Lilien-Teich am Rande der Westseite des Hale 'O Bali. Hale 'O Bali ist mit einer kompletten Küche mit Granit und Mahagoni-Schränke ausgestattet. Auf der großen 1100 Quadratmeter Fuß Porzellan gefliest Deck genießen Sie den Sonnenaufgang über den Ozean Horizont und spektakulären Panoramablick auf die Koolau Berge, Hut des Chinamans Island, und das türkisblaue und smaragdgrünen Farbtönen von Kaneohe Bay. Genießen Sie die üppigen, farbenfrohen und duftenden Gärten und Schlendern Sie durch die One-Morgen-Eigenschaft auf die Küste, etwa 300 Meter in der Länge .. Die große Liegewiese und Ozean Garten sind perfekt für Veranstaltungen und die 20 'hohen Lavagestein privacey Wand ist eine perfekte Kulisse für eine Veranstaltung Zelt oder Raum. Die NONswimming Strand ist schön, aber ist flach für einen so langen Weg aus und kann auch steinig sein und so ist nicht praktisch zum Schwimmen. Die Aussicht auf die Bucht und die Koolau Berge und Chinesen Hat Island ist atemberaubend von hier. Das Wasser ist hier sehr geschützt und eignen sich gut zum Bootfahren und paddleboarding. Es gibt einen weißen Sandstrand 3 Autominuten entfernt am Kualoa Beach Park. Es ist eines der zehn besten bewerteten Strände auf Oahu und hat extrem sicheren und geschützten Gewässern, die für alle Altersgruppen. Stichwort: Bayfront, Estate, einem Morgen Uferanlage mit zwei authentischen indonesischen Häuser. We had an absolutely wonderful time staying at Hale O'Bali. The home is just as described - even better in real life. The view of the ocean and mountains is truly spectacular. The home has all the amenities you would need for a short or long term stay. There were even beach chairs, a safe, and extra beach toys - an added bonus for my young son. It was perfect for my family of 3. My husband and I were travelling with our two year old and he loved the pond at the front of the house. The pond was very nice to hear going to sleep each night and really helped to block any noise from the road. The house has a spectacular backyard and oceanfront. My son was able to run around and play and I wasn't worried that he would be too close to the ocean. It is a perfect spot for families with young children. I loved the open-air feeling of being inside the Balinese style home - just wonderful to breath in Hawaii's fresh air. The property is very lush and well maintained. It is a beautiful experience to stay here! I loved the location. Not too far from Honolulu and the excitement of Waikiki or the beauty of Lanikai beach and upscale Kailua. If you head in the opposite direction you can head to Haleiwa and the North Shore. The home is very close to the stunning Botanical Gardens and every day you can pass by the beautiful Valley of the Temples. There are shops and grocery stores within a 10 minute drive, although the family selling the fruit just down the road at the small fruit stand has the best pineapple and papaya! Waiahole Poi Factory just down the road is a must-try! I recommend the squid luau plate - delish! I never would have discovered this restaurant had it not been for my stay at Hale O'Bali. There are plenty of stunning beaches within a few minutes drive of the home. Hale O'Bali is truly the perfect stay and I only hope we will stay here again one day! Thank you Leilani! I could not have said it better myself. Thank you so much for staying and enjoying yourselves! Thank you for such a thorough review packed with great observations and suggestions! Our stay in Hale O’Bali was delightful - beautiful location on the east side of O’ahu and all the amenities needed for a relaxing vacation. The home is the smaller of two residences on the same property, and while there were people in the other unit during our visit there were no issues and there is plenty space on the huge lanai’s for all. The home is built in the Balinese style and has an exotic, open feel - there is no AC but there are ceiling fans which provided more than enough airflow during our visit. A few points about the location - the home is in a secured area with a locked entrance gate and on the east side of the island which is more lush/rainy/tropical than the other parts of the island. The drive from Honolulu was about 30 minutes so there is easy access, and there are many beaches within 15 minutes to explore. The view from the lanai is stunning and this is a great place for sunrises though you cannot really swim here given the very shallow water in the bay by the home. The home is well furnished and perfect for a couple and perhaps a few children - the upper loft is the 2nd bedroom and would be a challenge for very young children but perfect for older children/teens. This was the first of three rentals we had in different parts of the island, and we are glad we stayed on this side as it is very different from the Honolulu and the North Shore. Overall 5 stars to Leilani for a wonderful stay in a very enjoyable home! Thank you so much for such a frankly lovely review! Wonderful place to stay on our family trip to Oahu! We had such a great time at Hale O'Bali on our family's first trip to Hawaii. The house is exactly as shown. The trade winds keep things really comfortable during the night and in the early morning/evening, and we were out and about during the warmest part of the day. The property is gorgeous! Our children enjoyed hunting for toads and lizards in the gardens. Leilani was prompt and professional throughout and we had everything we needed! Would happily stay here again. If you don't like staying in the city. Beautiful sunrises. Beautiful property. House was amazing, could use AC when it's very humid out, thankfull for the ceiling fans. All in all had a wonderful stay, away from the mayhem of Honolulu. Happy you enjoyed Hale 'O Bali! A weather front from a passing storm actually cut off the usual tradewind pattern and we experienced unusally warm and humid weather as a result! Fortunately the trade winds are always just around the corner and the lovely breezes normally remind us of how blessed we all are to be in such a paradise. We felt like we had hit the jackpot when we realized how beautiful the setting of this lovely cottage is. I could not wait to send pictures on Facebook to share with our friends and family how amazing it was. It was quiet and peaceful while we watched the sunrise while eating breakfast on the expansive deck and planning our daily activities. We had everything we needed while we were there as the cottage was fully equipped for our needs. The bed was very comfortable and we slept like babies with the water feature lulling us to sleep right outside our bedroom window. 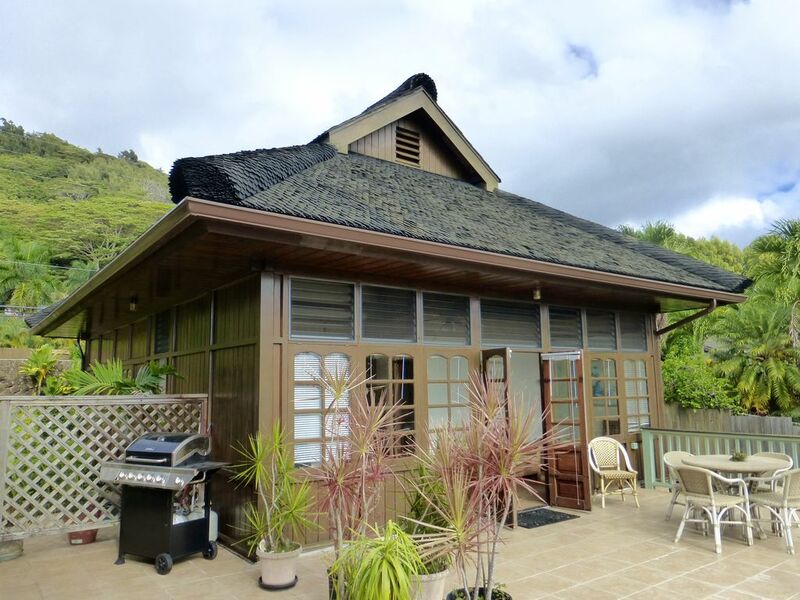 I would recommend this property without hesitation and know that if we return to the North Shore for another getaway we will certainly stay there again. Wow, thank you so much for these lovely comments. Its important to keep our guests as comfortable and well cared for as possible. We always try to be responsive, flexible and accommodating. So happy we were able to satisfy your requests. Schnorcheln / Tauchen, Abenteuer-Touren, Paintball, Reiten Trail Riding, sind Freizeitangebot der 4-Wheeling an Kualoa Ranch, die eine sehr enge Nachbarn 3 Meilen nördlich liegt. Senator Fongs Plantation in Kahaluu, Hart und Tagami Galerien in Kahaluu, Polynesian Cultural Center 20 Minuten nördlich in Laie, Byodo Inn japanischen buddhistischen Tempel mit Gärten und riesigen Koi-Teiche in Ahuimanu 7 Minuten südlich, Golfen am Pali Golf Course in Kaneohe, oder Turtle Bay Hilton etwa 35 Minuten nördlich in Kahuku.